The Vigilant was built in 1902 for the control and clearance of ships using the Port of London. Every year she undertook the “inspection” of every port from Gravesend to Penzance in Cornwall. With panelled deckhouse and spacious dining cabin, she was the pride and pleasure of His Majesty’s customs. In 1911, to celebrate the coronation of King George V, a Review of the Fleet was held at Spithead, between Portsmouth and the Isle of White. An Admiralty order came in that “no vessels, other than those flying the White Ensign (in other words the Royal Navy) were allowed to approach or enter the lines of warships”. Sir Laurence Guillemard, Chairman of Customs and Excise, informed the Admiralty that Vigilant would proceed down the lines, stating that the Department held a charter from King Charles II which gave it greater powers than the Navy in home waters. At the appropriate time Vigilant, flying the Customs flags, and in spite of heated objections, sailed down the lines of battleships and anchored at their head. Vigilant is now the only surviving vessel of the 1911 Review. 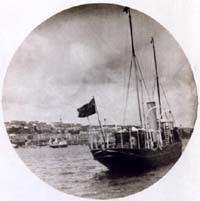 In 1920 Vigilant was sold out of the Customs service and converted from steam to diesel to become a cruising yacht. During the Second World War she was laid up. Being in American ownership she escaped requisition and possible destruction. After the war she continued to cruise. For a while she was used as a houseboat by Nancy Kelly. The Vigilant Trust was set up by Customs and Excise staff in 1992 to restore and preserve the vessel. Work was done to the hull on a slipway in Portchester. Funds were raised from several sources including the National Heritage Memorial Fund, Portsmouth Naval Base Property Trust, the Science Museum, the European Community, and from individual members of the Customs Service. The recuring issue of moorings then prevented any further restoration. Due to lack of space, the Vigilant Trust were asked to leave their moorings, or the boat would be scrapped. Sufficient funds could not be raised, and with less than a week to spare, the Medway Maritime Trust with the backing of National Historic Ships, and funds still held by the Vigilant Trust, offered a berth for the vessel and a pledge to restore her to full working order. Currently berthed at Chatham, Kent, Vigilant is being prepared by the Medway Maritime Trust for her [Next Phase of Restoration]. For a more detailed look at specifications, engine, build, and historical detail, click HERE.